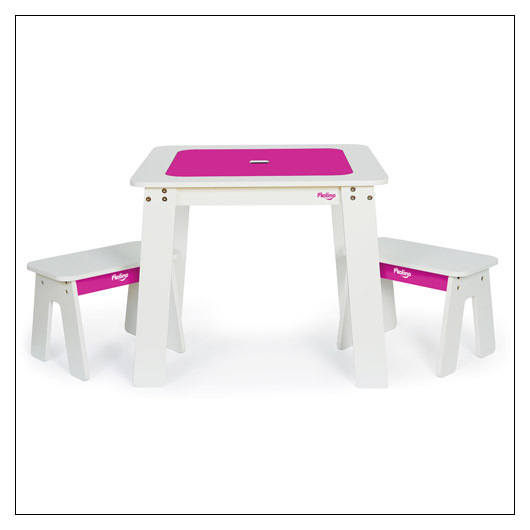 P'kolino Chalk Table (mspkchlktab) at Pure Design Kids / Tables and Desks / Tables ::: Kids' Toys, Furniture and More at Pure Design Kids! A Chalk Board Table with Easy Clean Up! Functionally smart chalk table with reversible table top quickly hides chalky mess and under the table storage compartment quickly organizes art supplies. Includes two child friendly benches with easy maneuverability and a playfully stylish contemporary design. *Chalk and other accessories shown are not included.